127 mm/51 Mk711 х 1 pcs. Arkansas Beta — American promo premium Tier IV battleship. A dreadnought with good armor, reasonably good armament for her time, and balanced performance, typical of U.S. Navy battleships. Due to a lack of AA armament, the ship was vulnerable to air strikes. 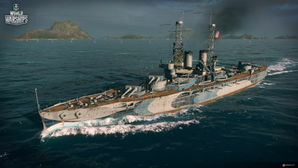 Arkansas Beta was given out as a gift ship to players who completed 49 or more matches of any mode during the Closed Beta. It is no longer available. Arkansas is essentially a stock Wyoming upgraded with the 28,000 hp propulsion and the hit points of the Wyoming (B) hull. The only other difference is that for some reason it has 0.7 less range than a stock Wyoming. As with American battleships, the armor is an all-or-nothing scheme with most of the protection surrounding the citadel, leaving the bow and stern vulnerable. The hard part of playing this ship is that she has absolutely no defense against enemy aircraft. If you find yourself being targeted by aircraft carriers, the only thing you can do about it is turn away, but that still won't do much good with the slow turning rate. If played as a close range brawler, her guns can destroy anything; the option to mount Main Battery Modification 3 allowing for a much higher rate of fire than a standard battleship of this tier. The only performance advantage the Arkansas has is that it has all access to all six upgrade slots. Of course, actually using all of those slots will cost the player 6,875,000 credits. Upgrade Slots 1 and 4 are already available on the Wyoming. Upgrade Slot 2 can be equipped with a Gun Firing Control System Modification 1 to improve firing range so that it nearly ties an elite Wyoming. However, that only serves to bring parity. Upgrade Slot 3, Slot 5, and Slot 6 are where any potential improvements are to be had. Premium ship, excellent for earning credits and developing captains. Has a faster top speed, equivalent to Wyoming with the engine upgrade. Can use all six upgrade slots, normally only available to ships at Tier IX and X. As a result of the above she can obtain a very high sustained damage output. Can reach an astoundingly low 10.2 km detection range when fully built for concealment. Secondaries can be formidable with upgrades. When fully optimized, the secondary armament has a maximum range of 6 km, same stock range as tier 10 "Montana"
Certain upgrades are required in order for the ship to perform at an acceptable level. Literally not a single AA gun and all carrier pilots know it. Deck armor is on the weak side; incoming high explosive rounds are a concern. Pretty slow, just like Wyoming. Don't plan on getting anywhere in a hurry. As a premium ship, Arkansas Beta doesn't have any upgrades to research. Slot 1: Main Armaments Modification 1 ( ) is the most common pick. Slot 2: Only one real choice exists for battleships: Damage Control System Modification 1 ( ). This will reduce chances of fire and flood. Slot 3: There are a couple of good options here. Secondary Battery Modification 2 ( ) will boost the range and accuracy of secondaries instead. Artillery Plotting Room Modification 1 ( ) will increase range and give secondaries a slight boost in range and accuracy, but may be a weaker choice than the other two. As a premium ship, Arkansas Beta comes included with Type 9 camouflage that lowers her detection radius, reduces the accuracy of incoming shells, and increases the amount of experience she earns. USS Arkansas (BB-33) was a dreadnought battleship, the second member of the Wyoming class, built by the United States Navy. She was the third ship of the US Navy named in honor of the 25th state, and was built by the New York Shipbuilding Corporation. She was laid down in January 1910, launched in January 1911, and commissioned into the Navy in September 1912. Arkansas was armed with a main battery of twelve 12 in (300 mm) guns and capable of a top speed of 20.5 knots (38.0 km/h; 23.6 mph). Arkansas served in both World Wars. During the First World War, she was part of Battleship Division Nine, which was attached to the British Grand Fleet, but she saw no action during the war. During the interwar years, Arkansas performed a variety of duties, including training cruises for midshipmen and goodwill visits overseas. Following the outbreak of World War II, Arkansas conducted Neutrality Patrols in the Atlantic prior to America's entry into the war. Thereafter, she escorted convoys to Europe through 1944; in June, she supported the invasion of Normandy, and in August she provided gunfire support to the invasion of southern France. In 1945, she transferred to the Pacific, and bombarded Japanese positions during the invasions of Iwo Jima and Okinawa. After the end of the war, she ferried troops back to the United States as part of Operation Magic Carpet. Arkansas was expended as a target in Operation Crossroads, a pair of nuclear weapon tests at Bikini Atoll in July 1946. Premium camouflage resembles the Measure 32 camouflage, which was introduced in 1943 during World War II; Arkansas is in her original 1912 configuration and was in overall gray. During World War 2, she was painted in Measure 31a, Design 7B camouflage. This page was last modified on 6 September 2018, at 22:37.